Is Using Food for Training Simply a Bribe? Lots of pet parents worry when they start training their dog that they are only bribing their pet to do what they want. Frustrated pet parents always tell trainers that their dog will only sit if they have food. So that begs the question, is using food for training simply a bribe and will it mean you have to keep bribing your dog to get behaviors you like? Rewarded Behavior (good or bad) gets repeated. Ignored Behavior eventually stops or extinguishes itself (but tends to escalate before it goes away). Once a behavior exists, a variable schedule of rewards will strengthen the behavior and it will continue to be utilized. Think for a moment about every dog that has learned to check the garbage for food or put their paws up on the counter to steal food. These naughty dogs often get in trouble when they are caught in the act but if the dog finds the behavior rewarding, they keep trying until it is no longer working. Smell is one of the dog’s most important senses. Not only does their sense of smell lead them to wonderful things, but it can build a neural pathway straight to the pleasure zone of the brain. This means that using food when training your dog will not only taste good but the entire experience from asking your dog to perform a behavior to receiving the reward will make your dog feel good. Dogs that get food for rewards during training get excited about being asked to do things and the whole process becomes rewarding. Stubborn is a trait that is put on dogs who are not properly motivated during training. There are a lot of smart dogs who learn their owner will go and get a “food bribe” if they ignore a command the first time it is asked. Remember the first law of learning, rewarded behavior gets repeated. If the dog has more patience than you, they are willing to wait for you to make the experience more rewarding. The most important thing to remember when using food for training if you don’t want to rely on it all the time is rewarding your dog using a variable schedule. Simply put, this means don’t reward every single sit, keep your dog guessing when the reward is coming. I ask my dogs for rapid fire behaviors by seeking 2 or 3 behaviors in a row. I will say “Ozzie sit, good boy” and release him, then “Ozzie sit, good boy!” and release him, and on the last one “Ozzie sit, YES!” (this is our reward word)” and reward with food. If you are a pet parent who is really trying to get away from food, the key is transitioning this exercise from food to a toy or game you play with your dog. Super charge a toy your dog loves to play with. For me this is a Frisbee; it is only present when we are playing together so I don’t leave it down for him to play with all the time. When we play Frisbee, Ozzie is asked to do all sorts of behaviors and when he gets them right I say, “yes!” and let that Frisbee fly. 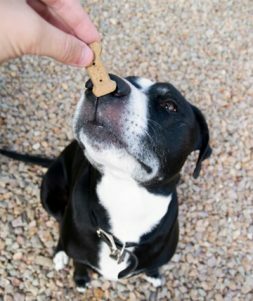 So the answer to our question, is using food for training simply a bribe, and will it mean you have to keep bribing your dog to get behaviors you like, is No. Training should be rewarding; the more the dog likes the process, the more he will offer those nice behaviors you have rewarded. Reward the behaviors you love and ignore and try to prevent the behaviors you don’t want your dog to make a habit.